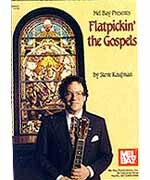 In this book, CD and DVD set, three time National Flatpicking Guitar Champion Steve Kaufman presents rousing guitar solos on 24 gospel favorites. Each song is shown with a melody part in notation and tablature, lyrics, an accompaniment part in tablature and a stirring flat- picking solo in notation and tablature. This recording is designed for listening first and second as an instructional tool. All 24 songs are played through three times at least. The first time is as it appears in the book and the two versions that follow are improvised versions. Making this a listening tool and an ear training tool. Recorded Digital to Analog in true stereo sound. This recording can be used with either Flatpickin' the Gospels or Autoharping the Gospels.